Hydrotech Reverse Osmosis is the best choice when you want the highest quality filtered RO water without the high cost of the big corporation costs. 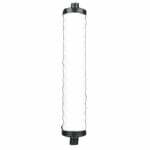 The Hydrotech 41400009 replacement carbon filter fits reverse osmosis filtration systems and performs as a polishing filter to reduce taste and odor. 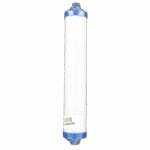 The Hydrotech S-FS-02, 41400008 Sediment Water Filter is a string wound depth gradient filter used in HT & HTF Series Reverse Osmosis Systems. 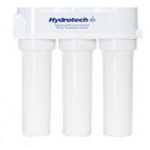 The Hydrotech 1240 M Series Reverse Osmosis System (4VTFC75G) filters water through four stages to ensure your water is free of the pathogens, dissolved solids and organics, pesticides and VOCs that lurk in your home's tap water. 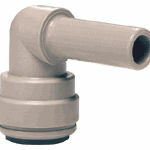 The Hydrotech Vessel Wrench for 1240 Series RO Systems fits all Hydrotech 1240 Reverse Osmosis systems. 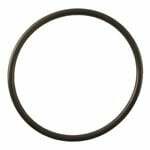 This Hydrotech 34201024 part is the o ring for the Inlet Valve Diaphragm Cover of the ASO Assembly for the Hydrotech 1240 Reverse Osmosis Systems. 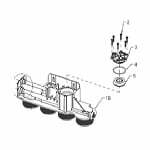 It is a replacement part for the three and four vessel units. The Hydrotech 1240 Series RO System Circuit Board is the replacement component for Hydrotech 12402 & Hydrotech 12403 Advanced Reverse Osmosis Systems. 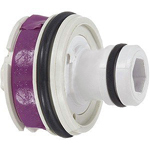 The Hydrotech 1240 Pro Series, Hydrotech's premier line of reverse osmosis sytems, features a Smartap push button monitor that tells you when you should change your membrane. The Hydrotech Aqua Flo E75TFC-3SF Reverse Osmosis System with Pro Tank is a 4-stage reverse osmosis system set at an economical price point for price-conscious consumers. 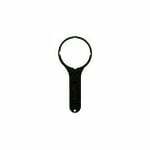 The Drain Clamp Assembly with Saddle Clamp is replacement part number 42000002 for Hydrotech reverse osmosis models 12301, 12302, 12303 and 12304. 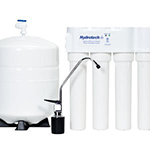 The Hydrotech 1240 E Series Reverse Osmosis System filters water through three stages to ensure your water is free of the pathogens, dissolved solids and organics, pesticides and VOCs that lurk in your tap water. The Hydrotech 1240 E Series Reverse Osmosis System (3VTFC50G) filters water through three stages to ensure your water is free of the pathogens, dissolved solids and organics, pesticides and VOCs that lurk in your tap water. The Hydrotech 1240 M Series Reverse Osmosis System (4VTFC25G) filters water through four stages to ensure your water is free of the pathogens, dissolved solids and organics, pesticides and VOCs that lurk in your home's tap water. 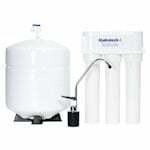 The Hydrotech 1240 M Series Reverse Osmosis System (4VTFC50G) filters water through four stages to ensure your water is free of the pathogens, dissolved solids and organics, pesticides and VOCs that lurk in your home's tap water. The Aqua Flo E50TFC-3SF Reverse Osmosis System is a 4-Stage RO System set at an economical price point for price-conscious consumers. Enjoy great tasting water at a fraction of the cost of bottled water! 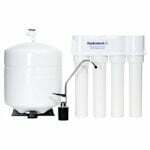 The Hydrotech 1240 Pro Series Reverse Osmosis System (4VTFC50GPB) filters water through four stages to ensure your water is free of the pathogens, dissolved solids and organics, pesticides and VOCs that lurk in your home's tap water. 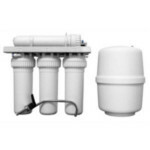 The Hydrotech 1240 M Series Reverse Osmosis System (4VTFC09G) filters water through four stages to ensure your water is free of the pathogens, dissolved solids and organics, pesticides and VOCs that lurk in your home's tap water. 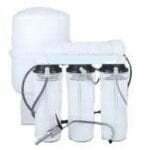 The Hydrotech 33138 Retrofit Kit replaces the Hydrotech 40600006 Flow Control that was used in the following discontinued Hydrotech Reverse Osmosis Systems: 101 Series, 102 Series, 103 Series, 1010 Series, 1020 Series and 1030 Series. 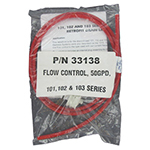 The Hydrotech 40600006 35 GPD Flow Control (Purple Band). 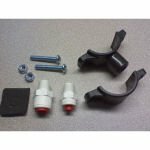 The Elbow and 1/4" Stem with red collet is replacement part number 33503505 for Hydrotech reverse osmosis models 12301, 12302 and 12303. 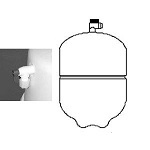 The Elbow with Stem connects the flow restricter tube to the RO manifold.